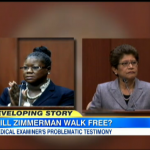 Dan appeared on Good Morning America this morning to discuss the prosecution in the Zimmerman Trial. On Day 9 of the trial, the prosecution rests and the defense asks for all charges to be dismissed. Dan says, “The prosecution’s case is now it; they’ve presented all of their evidence and I do not see how a jury, as a legal matter, convicts of either second degree murder or manslaughter. Now that does not mean that George Zimmerman was justified, it does not mean George Zimmerman was right. It means that when the prosecution has the burden to prove this case beyond a reasonable doubt meaning. They have the responsibility to disprove self defense beyond a reasonable doubt. It is hard to imagine that all the witnesses we’ve seen that there is not reasonable doubt as to that, up to this point. This is just the prosecution’s case and even amongst those prosecution witness things we have seen testimony. Which it’s hard to imagine would not be perceived as reasonable doubt.” Watch the segment here.